The Tamerica V2000-Pro Hot Knife Velobind binding machine offers a convenient Velobind machine with a "hot knife" which quickly and easily slices off the excess binding strip and rivets the document together. Capable of binding with both 1" and 2" binding strips, punching 20 sheets of 20lb paper, and telling you when the binding cycle is complete with an indicator light, the V2000 Pro is a reliable, easy to use Velobind machine. The V2000pro has a 14" throat for oversized documents. If you are looking for an easy to use, efficient Velobind machine, look no further than the Tamerica V 2000-Pro Hot Knife Velobind machine. Compatible with VeloBind 1" and 2" Strips. 8-10 seconds per bind cycle. Fits letter and legal sized documents. Hot Knife cuts off excess binding strip. Dimensions: 24" x 19" x 11"
Welcome to MyBinding video. 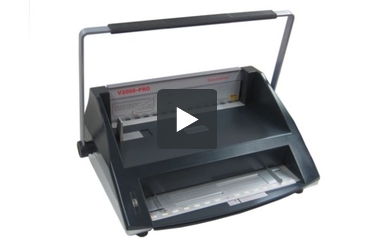 Let's have a look at the Tamerica V2000 Pro, a hot knife VeloBind-style binding machine. Binding books in this unique and stylish way is easy to do. Let's watch the V2000 Pro in action. The first thing to do is set your side margin guides so that all your punches are consistent throughout your project. And start with scratch paper for first. Use the lever arm with one or two hands and make your punches. Once it's all set, start with the covers and punch through the rest of your project. When all your holes are punched, gather your project together. It's time to bind. Select the size binding strip that you need, one or two inches, and lift up the back fence. With the flat side of the bind, make sure the texture side is faced down and the pin goes over the little hole that holds it in place. On top of this, you'll place your project face up and set the side margin there as well to make sure the holes line up right. Put the male end down in through the holes, all the way across. Put the fence down and bring the lever down. That will engage the hot knife. When the light turns on, you know you're ready. Lift the lever, lift the fence, and remove your book. And you're all set. The book is stylish, secure, and quite unique. Below the machine is a small tray that gathers all the punches and chips. It's as easy as that with the Tamerica V2000 Pro SecureBind. For more demos, reviews, and how tos on this product and many more, check out MyBinding.com. If you're interested in document finishing, chances are you've heard of things such as plastic comb and wire binding. There's also Velobind, a method that can really make your documents look great. To utilize this method, you need the right machine, such as the Tamerica V2000-Pro. Here's what you need to know about both Velobind and this machine. Velobind is one of the most sophisticated-looking binding methods available. It binds your documents together with strips containing plastic tines. The result you get both looks and feels like a book you would purchase in a bookstore. Plus, the binding is incredibly strong, so this is a great binding method to use when both looks and security matter. The V2000-Pro is compatible with both letter- and legal-sized documents. These items can be either 8.5" x 11" or 8.5" x 14". This machine has a 14-inch throat that can handle both sizes so you'll have a lot of freedom when it comes to the kind of documents you produce. This machine can punch up to 20 pieces of paper at one time. The punching capacity will be fine for thinner documents, but you may find it tedious if you need to prepare a book that contains a lot of pages. Also, each unit has a built-in chip tray so you can keep your workspace free of paper particles. The V2000-Pro is compatible with Velobind strips that are both 1" and 2" thick. These supplies have binding capacities of 250 and 500 sheets, respectively. However, you cannot use the 3" strips that are able to bind a whopping 750 pages together simply because the machine wasn't designed to handle them. If you're in a hurry, you'll be pleased to know that this device's binding cycle only takes about 8 to 10 seconds. This will make it easy to bind as many books as possible in just a small amount of time. This device has a hot knife system that's able to cut any excess plastic from the binding strip. That way, you can use strips of just one length for all sizes of documents. The knife's presence also ensures that your pages are bound securely together. You'll have to make some room for the V2000-Pro because it has dimensions of 22" (width) x 15-7/8" (depth) x 8-3/4" (height). The height is increased by several inches when the machine's handle is up. You'll notice that the handle is D-shaped, which makes it perfect for both right- and left-handed users. Finally, the V2000-Pro comes with a limited one-year warranty. Velobind is simply one of the better binding methods around and the Tamerica V2000-Pro makes it easy to produce well-bound documents. While the punching capacity could be improved, this device has a good binding capacity, and it's able to process your documents very quickly. You'll also appreciate the hot knife system that makes it possible to use Velobind strips that are just one length. But, most of all, you're definitely going to be pleased with how your documents look. So take a look at this machine today so you can discover the world of Velobind. The last step of melting or removing the tips is not happening. We place the metal bar down on the document, pull the lever down (the light comes on) and when the light goes off we lift up the bar, but the pegs are still there. Nothing is happening. To address technical issues, the best first step is to contact the manufacturers technical support department. The manufacturer is Tamerica and their phone number is 1-800-822-6555.